I am still loving them so much. offering a My Sweet Savannah reader a pillow cover of their choice! I love all the different patterns and colors! please visit her shop and then leave me a comment on this post letting me know which one you would pick if you won. at checkout to receive 20% off your purchase at 6 Wilson. Offer expires on Saturday, I will pick a winner for the pillow cover and announce back here on Friday. I would pick the Schumacher emerald. The green is gorgeous, isn't it? Thanks for the giveaway! I would love the blue embroidered diamond pattern! I LOVE the Schumacher emerald pillow!!!! That green would be the perfect pop of color for my dining room!! Great giveaway!!! Thank you!!! I love the High End Designer 12x16 Light Brown and Ivory Circle Floral......so pretty!!!! I love the navy and cream diamond pattern. Perfect for my sunroom! They are all beautiful though. Love the combination of blue pillows that you featured! I love the embroidered pillows. I think I would choose the embroidered lavender option for my daughter's room. The blue and white pillows are classic, wonderful giveaway! Wonderful giveaway! My favorite is the 20x20 Blue and White Damask. So many cute options! I love the linen Off White Taupe Blue Embroidered Diamond Pattern. It would look so cute on my navy living room chair! Wow! That's a lotta of pillows! I thought it would be the 12x16 Light Brown and Ivory Circle pillow- that was until I saw the Designer Monogram in the metallic mushroom...Wow.That's a lotta pillows! Thanks for a great give away! Oh, how fun! Love her stuff! I'd choose the English Designer one with the big red pine cone! Gorgeous! Her pillows are beautiful! I love the light brown with ivory circles. I love the navy and white stripe pillow (chambray). Thanks for the opportunity! I would go with classic black and white silk check, they are so gorgeous! I would get Designer Red Embroidered Diamond Pattern Natural Linen Decorative Throw Toss Pillow Cover. What a great giveaway - thanks! I LOVE the Designer Highland Court 11x20 Lumbar! Thank you for offering this giveaway! Keeping my fingers crossed. Huge fan of jJohn Robshaw and I love the paisley one . Lovely giveaway. Thanks for the chance. I love the High End Designer 14x24 Light Brown and Ivory French Country Floral wth Flange Trim Decorative Throw Toss Pillow Cover Great for Bed or Sofa! There are so many beautiful choices. 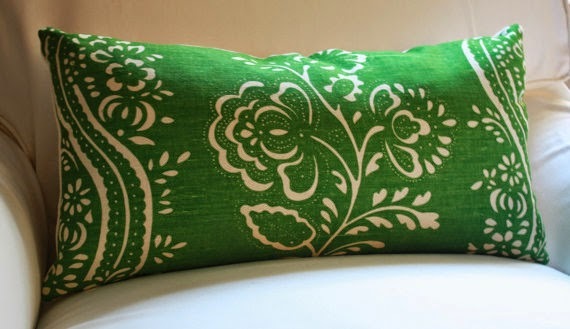 I love the dark celery green and persimmon orange lumbar pillow! It would look great in our livingroom! How can I pick just one?! The Suzani Coral Green and Blue, and Gray Beige White Linen Fern Leaf Modern Design are my faves! 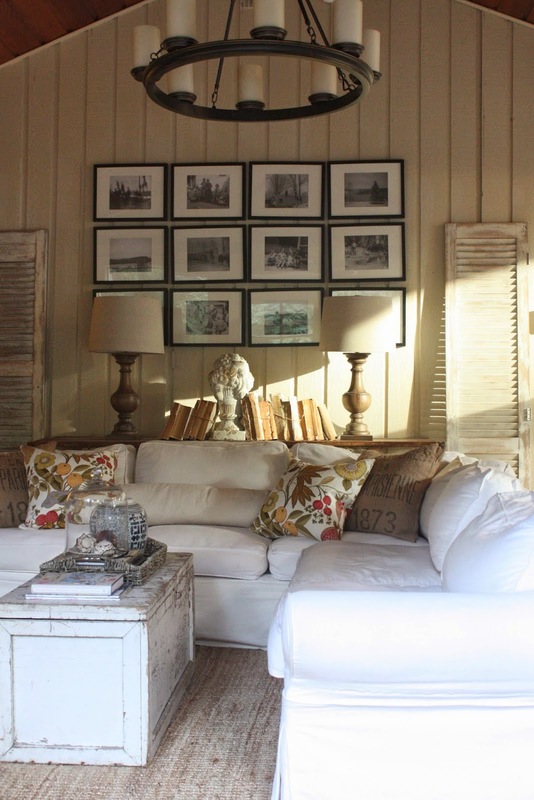 The Designer White linen with Navy is exactly the direction I want to go in my family room! Love!!! I think I'd pick the Designer 18x18 Gray and Cream Linen Geometric Throw, Toss, Decorative Pillow Cover. I'm getting married in June and my fiancé and I just bought our first couch, so it would be great to have a really nice pillow for it! I would love a designer custom monogram pillow! The blue and white pillows are classic, This is a wonderful giveaway would look great in my room! I love the High End English Designer Embroidered Linen Stripe Ivory and Coral Red. Gorgeous! Oh good lord. The Navy Zebra pattern is so fun! Beautiful! I especially like the Designer Ikat in blue. So very pretty!!! So hard to pick: red embroidered diamond pattern or the thibault yellow gray taupe floral. It's really hard to say, because of them would fit in one room or another in my house. I really like the monogrammed ones, but the gray and white floral motif ones are probably my favorite. However, I do like the beige and white circle floral. I hope I've got the name right, I like the square size the best. Oh my! So many choices. Wow... she really has some pretty pillows I liked the red buffalo check or the Designer Blue and Ivory Cream Floral Reversible. They are all so pretty hard to choose one. 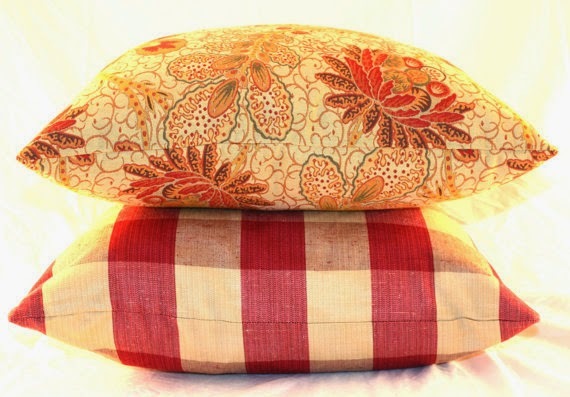 So many beautiful choices, but I would love the Raspberry Red and Beige Buffalo Check pillow! Thanks for the giveaway! I like the Robert Allen Pale Yellow Diamond pillow. My fav is the green you listed, but I don't see it in her store. They all are beautiful! Oh, to pick just one! Such gorgeous pillows--I do think the Lt Blue and Ivory Damask would add so much to our master bedroom..
Love the cream & grey geometric linen throw pillow! 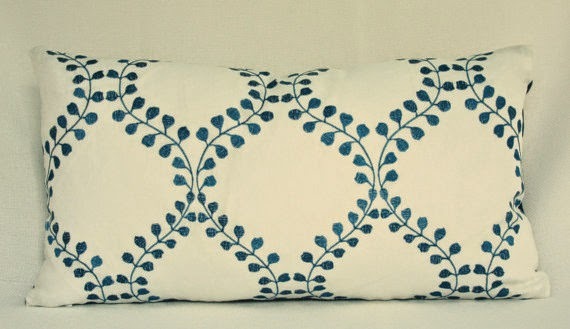 Love, love, LOVE the Designer Blue White Geometric 11x20 Lumbar Pillow. GORGEOUS! The Designer Ikat Navy Blue and Light Beige 14x24 Decorative Toss Throw Pillow Cover Classic for a Sofa, Boys Room or Bedding is stunning. What a fun giveaway! I like the ones you posted, but I absolutely LOVE the Designer Ikat orange and lavender linen and cotton one! It's fab! Boho chic at it's finest! Sorry for the deleted comments, my google account is acting up. Here is my email in case I win (fingers crossed!!!) karifpayne at yahoo dot com thx!! The Designer Blue White Geometric 11x20 Lumbar Pillow would be perfect for my bedroom I'm redecorating! After your first post showcasing her work, I went and checked out her work. Love it all!! Anything with blue in it and I am sold. These are fab! I love the leopard red, but these days, any warm hues make me happy! I've loved anything navy blue forever! My choice is the Ikat navy blue and Cream 14x24 pillow cover. Lovely things. I love the Suzani Coral Green and Blue. I love the leopard velvet pillow -perfect!! I really love the last green pillow on your post, but couldn't find it in the shop! Otherwise, I like the celery green velvet. Thanks! I love the cream and tan damask! They are all beautiful! Thank you for the chance to win! Ohandplusalso, you are my decorating hero! ooo not sure I can pick just one... i love the dragon and the green one that you picked but I also love the blue and green paisley as well as the orange and oatmeal floral. Thank you!! I'm not sure I can choose just one! However, I think my favorite is the designer Highland Court golden beige and ivory damask. It would be marvelous in my living room. Thanks! I LOVE the light blue and ivory damask linen! Would look perfect on my bed!! I love the Off White and Platinum Gray Cotton Silk Stripe, but there are so many great ones to choose from! 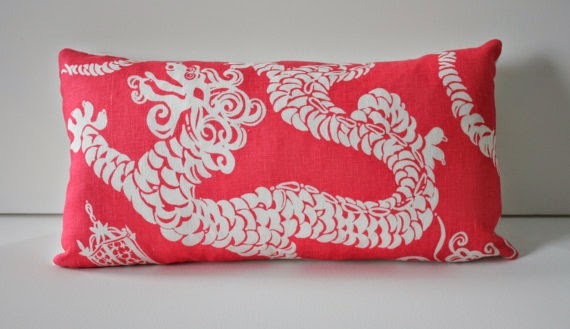 Designer Lee Jofa Dragon in Pink Coral and White Linen 11x20 Lumbar Decorative Throw Toss Asian Pillow cover. Gorgeous! I'm in love with the nautical sailboat lumbar pillow in yellow, navy and cream. Gorgeous! I am LOVIN the Schumacher linen with trees in mocha and blue, 11x20 pillow! Thanks for giving me something to look forward to all week. Very generous offer from 6 Wilson. I am having a hard time choosing only one but I finally decided on color. Designer Ikat Orange and Lavender Linen and Cotton is my favorite. Love the Green pillow.. it would be a great addition to my other ones! Great fabric choices and designs! Thanks and have a great night. I would love the Designer 20x20 Blue and White Damask pillow. Thanks for the giveaway. although I would love many of them, I guess I would go with High End Designer Embroidered Suzani Coral Green and Blue 20 inch Decorative Throw Toss Pillow Cover. I like the designer Gray Beige white linen fern leaf pillow. They are all so gorgeous! Too too pretty!!! What a lovely give away and great way to start the summer. Hard to choose one, but I loved the Designer Kravet Watermelon and Kelly Green Linen Paisley. Maybe it was the word WATERMELON? Thanks so much. So hard to pick just one! If I won, I'd choose the High End Designer. Thank you for a chance! Love the Designer Luxurious Copper Italian Silk Floral Embossed Velvet Decorative Toss Throw Pillow Cover. Love'em all...lol but Designer Blue and Ivory Cream Floral Reversible are my fave. Love the blue/green duck egg 20" pillow! Such beautiful options! I would choose the White Linen Navy Blue Embroidered 11X20 Decorative Throw. Changing my color scheme to blue and white. So any in those colors would be great! I would pick the taupe & coral red on Ivory linen floral & fruit.....love it! Thanks for such a great give-away! Love the Cream/Navy/Light Blue and Green Paisley..& just a few others. Thanks for the giveaway. I really like the Orange and Red French Country Throw Toss Floral. I would like to use that as an inspiration piece in my family room. The colors are great. Love the blue and cream damask. Her site is lovely. Great selection of fabrics as well. Crushing on the Light Brown and Ivory Circle Floral Pattern. Thank you for an awesome giveaway. Love the RL navy and yellow plaid cover! Pink leopard is calling me!!!!!! Hard to choose! I like the designer embroidered duck egg pillow and the white linen navy floral pillow. gorgeous! So hard to pick one! In love with Designer White Linen Navy Blue Embroidered 11X20. I can't pick 1 fave so I managed to narrow it down to 2 for now! The "Ivory Cream Embroidery Flower Leaves on Blue and Natural Ticking Beachy Preppy Stripe" and the "Raspberry Red Buffalo Check". Such a great variety! Blue white geometric since i just order the coral dragon!! !thanks for the chance!kathy b.
I would have to go with the black and white quilted check pillows with the red trim! So cute!! I love the Designer Ikat Navy Blue. What a fun pillow. Thanks for the giveaway!! So many choices, but I think my favorite is the French Country pillow, or maybe the red and beige leaves. Lovely fabrics and choices. Great pillows --- love the fox wearing a Christmas scarf so he is my choice!! Call me simple, but I love the red/natural ticking stripe. Reminds me of my grandparents' farm. love the Suzanne Kasler Montmartre Embroidery pillow!! Anyone would be fabulous but if I must say so I am fond of the blue and grays. I LOVE the blue and white chinioserie pillow! Thanks for the tip on a great Etsy seller and this contest. I hope I win! All of these are so pretty. My choice wold be the Designer White Linen Navy Blue Embroidered pillow. Thanks for the link to his site. wow, what a great shop, so many beautiful pillows. i would start with the high end designer vivid multi pillow! Ooh... Love the navy and white pillow! Such cute pillows! I am loving the High End English Designer Embroidered Linen Stripe Ivory and Coral Coastal pillow. Boy, that's a mouthful! Hope I win-thanks. 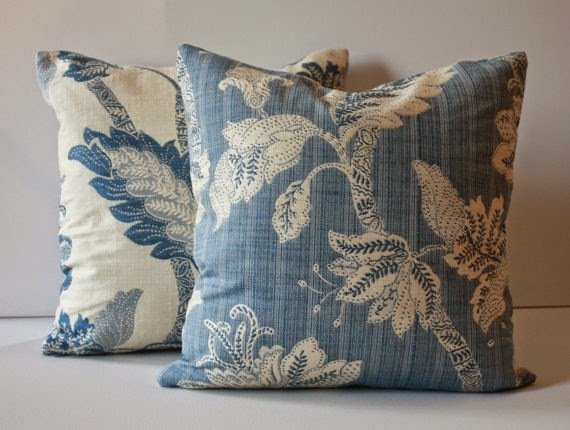 I am torn between the White Linen and Navy Blue vine design and the Blue and White geometric lumbar pillow. Beautiful! Thank you for the opportunity. I fell in love with the 1st pillow on the shop site, the High End English Designer Taupe and Coral Red on Ivory Linen Floral and Fruit w Contrast Ivory Cotton Back Decorative Throw Toss Pillow Cover. I've been wanting to do black and red in my guest room but needed a start. I would love to use this pillow as my color guide, and wouldn't it focus attention on the bed! It's great inspiration! I love all of them - it is hard to pick. But I would probably choose one of the blue and white ones. What a lovely selection of pillows and unique fabrics... Thank you for highlighting this Designer! My favorite was the Designer Gray-Beige-White Linen Fern Leaf Modern. I don't normally like an abstract print but loved the soft tones of this fabric! i like the golden yellow, navy cream sailboat nautical 14 X 24 lumbar. thanks for the great giveaway. These pillows are all so beautiful! I would choose the "High End Designer Vivid Multi Color Watercolor Inspired Floral on White Linen w Pink Blue Orchid Lumbar Decorative throw Toss Pillow Cover"
the ikat navy/beige pillow cover. thanks for the chance! I would choose the English Designer Hazelton House Purple Green Red Blue Floral Hand Blocked 11x20 lumbar cover. I would have to pick the Hazelton House. That purple is divine! Wow, what a difficult choice! High I love the High End English Designer Taupe and Coral Red.